Get free software from Microsoft and More! As as student of Fanshawe College, you are entitled to select Microsoft Office Products for Academic and Personal use absolutely free*! Have a FanshaweOnline account in good standing. Please follow the instructions below to receive your free software! Please ensure that you read all the instructions carefully. We recommend that you read over the instructions ahead of time to ensure that you understand what must be done. NOTE: Unless you have visited this page before, you do NOT have an account on this site! This site is not run by Fanshawe College. You MUST create an account first before you can download the products! The next step is to enter your FanshaweOnline (FOL) Email Address. 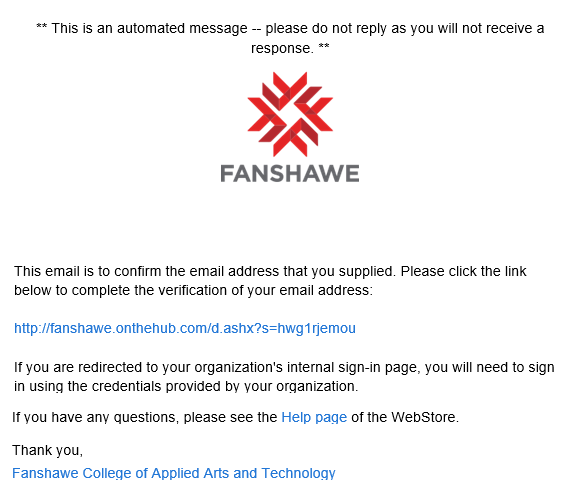 You must use your FOL email in order to confirm that you are a student of Fanshawe College. Do not contactuse your personal email, such as Google, Yahoo or Hotmail. Your FOL Email is your username (i.e. j_smith followed by @fanshaweonline.ca) If you are unsure, you can us to find out what your username/email is. Enter your FOL Email address in the box, then click Continue to proceed. On the next page, you must fill out all the forms, including your First Name, Last Name, Email Address (leave as your FOL email), Password, Group to which you belong to (Students) and lastly the Captcha code at the bottom. Please note that the username is your FOL Email and cannot be changed. Your password can be set to your FOL password, however these two accounts are not linked, therefore it can differ. The IT Service Desk cannot help you reset lost passwords on the OnTheHub website. Please fill out all forms, then click “Register” to proceed. You’re almost there! After you click the Register button, you will be presented with the page below, you must now verify your email by logging into your FanshaweOnline account. After seeing this page, you have to verify your account in FanshaweOnline. Before you can use this service, you must verify your account by logging into FanshaweOnline. You should receive an email from Kivuto with the subject “Email Address Confirmation”. This email may take a few minutes to arrive. If you have issues receiving this email, you must contact Kivuto directly. An example email you will receive. In some cases, you must Right Click on the Link, and click “Open in New Window” or “Open in New Tab” if nothing happens when you click on the Link. After you click the link, you may have to log in (Using the Username and Password you made in Step 2). After this is done, your account will be verified. After you have completed Steps 2 and 3, you will be able to Log Into the OnTheHub portal to download the software. You can log in by clicking the button below. The login page will ask you for your Username and Password. The Username is Always your FanshaweOnline Email (i.e. j_smith@fanshaweonline.ca), and the password is the password you set in Step 2. If you forgot your password, you can use the Reset Password link on the login page to reset your OnTheHub Password (Resetting your password for OnTheHub does not reset your Password for FanshaweOnline). If you have issues, please contact Kivuto. You will see this form when you are on the login page. After you login, you will see a list of software that is currently on offer. 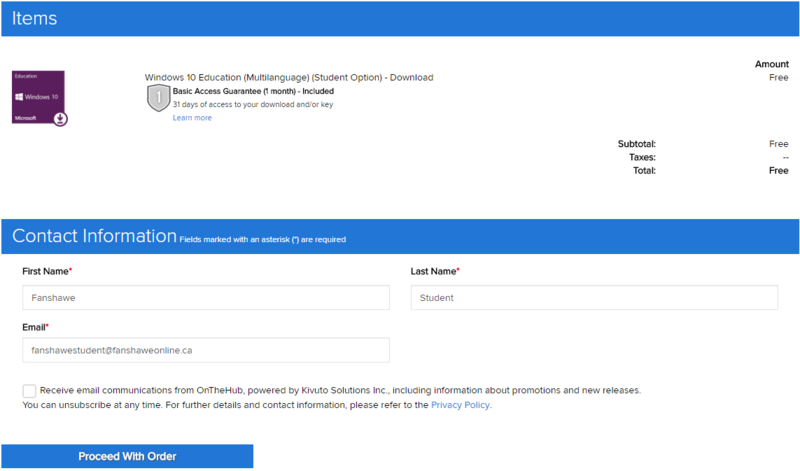 Please note that Fanshawe does not offer this software, and unfortunately does not support assisting with the installation, purchase, of support thereof, with the exception of what’s written in this guide. For this example, we will be using Windows 10 as an example. The first step is to click on the “Windows 10” Product. You will be redirected to a page where you can review the Description, System Requirements, and Eligibility sections. After reviewing the page, click the “Add to Cart” button. Click the “Add to Cart” button once you read over all the sections. After you click the “Add to Cart” button, you will be given the option of checking out right away. You will also be presented with additional offers. Once you are ready, hit the Check Out button to proceed to the checkout. 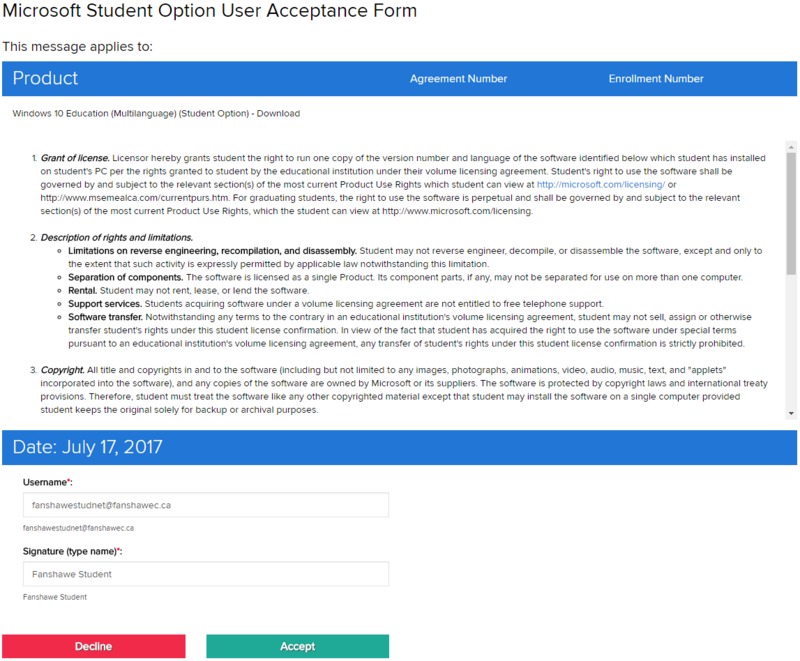 On the next page, you will have to read over the end user agreement on the page, then fill out the form – you will have to enter your full name and your FanshaweOnline Email Address exactly as it appears as shown below. If you agree, click the Agree button to continue. 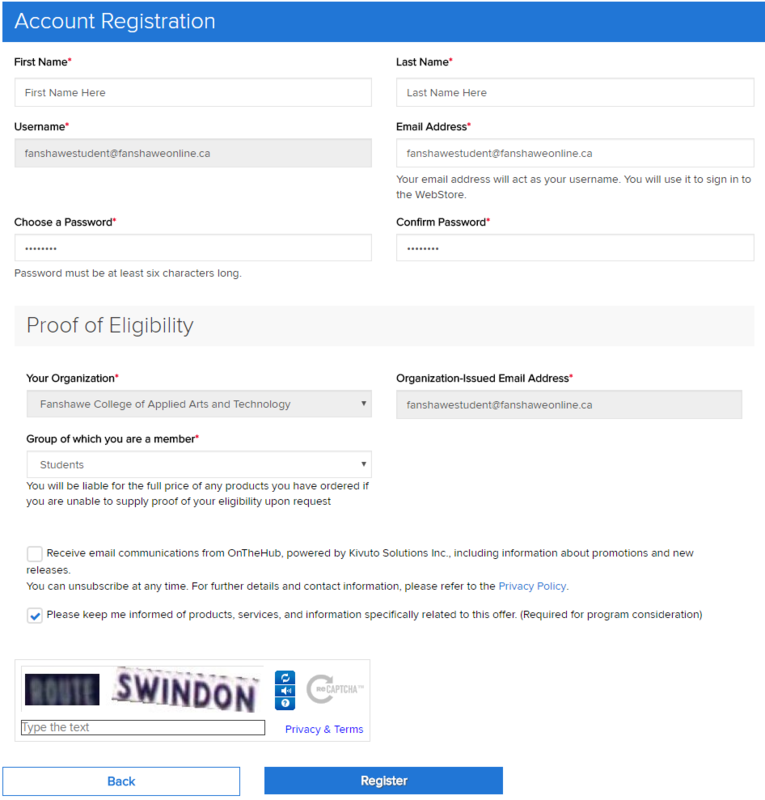 User Acceptance Form – You must read and agree to the terms and conditions above. After you accept the agreement above, you will see the summary of your order, and have one last chance to cancel it, should you change your mind. Fill in the contact details below – this is where the receipt will be sent. After you have filled out the fields, click the “Proceed with Order” button to finish the order. After you proceed with the order, you will see the on the last page, the product key, download and total cost for the order. You may now proceed to download the software and install it. On the last screen, you will see the product, download link, and product key. When you purchase the software, you are given 30 days to view the Product Key and Download the software. The software does not expire (except if explicitly mentioned in the software description). After 30 days you will no longer be able to download, view, or otherwise manage your purchase. If this happens, you will have to contact Kivuto, a charge will apply for the reactivation. 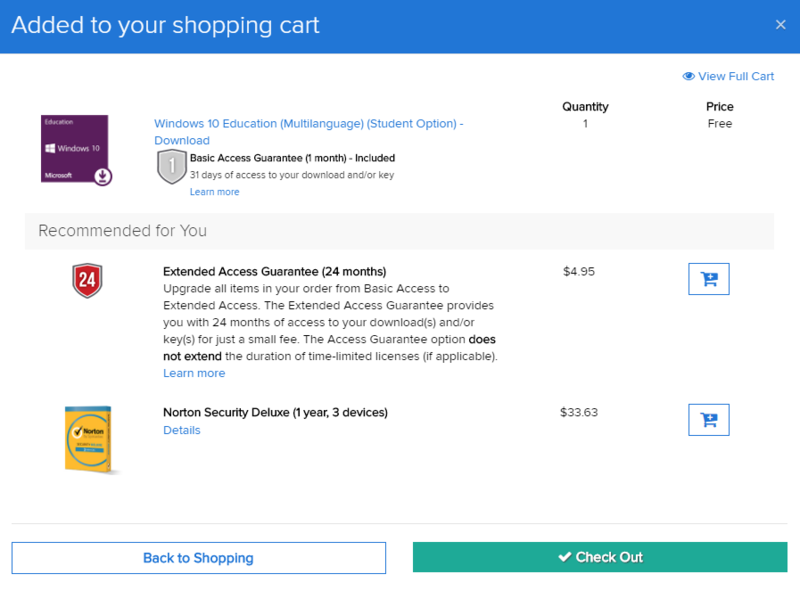 You also have the option, during and after checkout, to order either a 24 month extension for this (extending from 30 days) or backup installation media (via USB or CD/DVD disks). This service is available for an added fee. As mentioned, unfortunately neither Fanshawe College, nor the IT Service Desk can provide support for the registration, ordering, or installation process or for products obtained on the OnTheHub website. Support is exclusively handled by Kivuto and can be contacted by means specified here. You may also view the Kivuto FAQ by going here. The process for staff is largely the same as students, however with the exception of Step 2. For step 2, you will be required to supply your @Fanshawec.ca Email account, and select the proper group – Staff or Faculty. Support availability applies to staff as well. Software for staff, however, is not free, it requires a payment, which varies based on currency conversion and product. If you are looking to download Microsoft Office, please visit the new Office 365 Landing Page. Microsoft Office products through our partnership with Kivuto will be discontinued on September 1, 2018, after which you will only be able to download Microsoft Windows from Kivuto. If you are looking to download Windows, Microsoft Project (if applicable) or other products, please close this window.